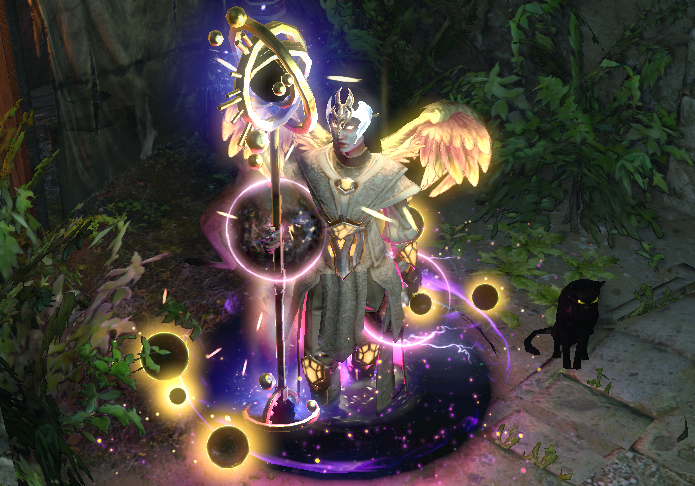 I've loved Path of Exile for years and played tons of characters, Ball lightning is one of my absolute favourites. It creates a projectile that pulses quickly, hitting everything in its reach. Since it auto pierces and has big AOE, one cast clears multiple packs as we run along with it. This combined with the fact that we automate almost everything makes for an easy and fun playstyle. Uber Elder down on Synthesis, video coming soon. Please feel free to ask questions here or on my Stream. Occultist gives us everything we need. We get power charge generation, stun immunity, AOE, spell damage, regen and uninterrupted ES recharge if began recently. Profane bloom is perfect since we path near the double curse cluster anyway. You can run Malediction instead of Forbidden Power, just need to get some way of generating power charges on single target bosses. Alira is the best option. If you can make up for the loss of 45 resist, taking the 2 points is possible but will make gearing harder / more expensive. Lunaris and Gruthkul together give us 13% reduced physical damage taken, a bunch of other defensive bonuses, and movespeed. I swap to Solaris for big bosses. Spell echo is one of the best ways to scale BL damage. This is because balls created in the same cast cannot shotgun, while echoed casts can. We also love the mana and tons of spell damage is great. The best part is they sell for nothing, you can buy a 155 spell power for 3c on synthesis right now. Remember you will need 113 STR to equip this. Free Wrath, ES and crit. Ball lightning is very strong with ES gain on hit so get that ASAP. Anything else is bonus, although a clarity mod is quite helpful. Helm - Additional Projectile. We dont really need more damage, and this gives us a big clearspeed boost with no downside. Boots - 10% penetration if you havnt killed recently. Very strong for high hp one target fights. You will need 113 STR to equip pledge of hands, and OPTIONALLY 111 DEX to use Slower Projectiles. You can take the +30 node for each, or totally ignore DEX. I wear a second staff to quickly swap to slower projectiles for bosses. This is optional, and not really needed until late game. Leveling this right now, excited to play BL again lets see how it goes.